Compared to prior generation products the Quadro RTX 4000 reset performance and feature expectations. While previous Quadro boards were standout performers in their day, the latest RTX GPUs implement two new types of cores that accelerate rendering and artificial intelligence. RT Cores, designed from the ground up for cinematic quality real-time ray tracing, and enhanced Tensor Cores, designed to accelerate AI and Deep Learning. From the perspectives of designers, engineers, and architects, the benefits of working with the innovative RTX 4000 became immediately apparent. Blowing the older GPUs out of the water, Quadro RTX nearly doubled the 4K resolution FPS (Frames Per Second) output of its predecessors. When tested with various industry applications, the Quadro RTX 4000 delivered higher image quality and frame rates, showcasing its clear superiority when executing demanding graphics and compute tasks. These results were obtained with software that hasn’t even been fully optimized for the Quadro RTX 4000’s Turing architecture, but they offer a glimpse of forward compatibility and significant performance and feature enhancements as the RT Cores and Tensor Cores are fully supported by updated software, and all reviewers expressed eagerness to track the growth of the Quadro RTX 4000. Named this month’s Editor’s Choice by Techgage, it’s clear those in the know have already begun recognizing the potential present in this powerful new product. 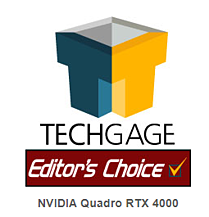 To read the full reviews of the Quadro RTX 4000, follow this link to Techgage, or read Develop 3Ds take on the evolution of GPU technology. 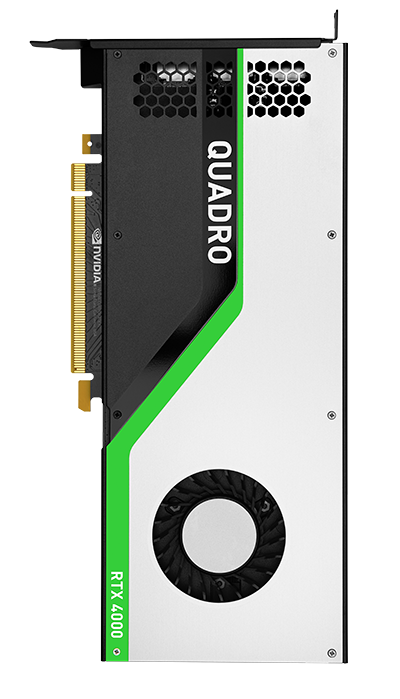 For more information about next generation Quadro RTX GPUs, visit our website, and see the future for yourself.